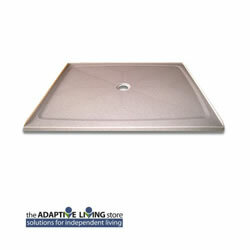 Walk In Shower Base with Surround Panels, matching ramp and accessories available. Left, right, or center drain. Weighted Shower Curtain and Caregiver Height Weighted Curtain works with the Rubber WaterStopper to minimize wet floors. Left, Right, or Center Drain.